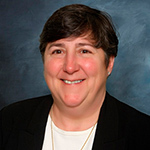 Sally L. Maher has been VP of Regulatory & Clinical Affairs since May 2012. She has more than 25 years of medical device and combination product experience in regulatory, clinical, reimbursement, healthcare compliance and product development. Prior to joining Edwards, Maher held various Senior Vice President of roles at Smith & Nephew’s Advanced Surgical Products Division including, Regulatory & Clinical Affairs, Reimbursement & Healthcare Economics , Healthcare Compliance, Research & Development, and New Business Development. Prior to Smith & Nephew, Maher worked in Regulatory Quality & Clinical for various organizations including J&J, Pfizer & FDA. She received a bachelor’s degree from Ohio Wesleyan University, and a law degree from the University of Baltimore.